acaAcademy of Creative Arts is a school of arts formed with a vision of providing various forms of creative and performing arts under one roof for students and parents of Boston area. 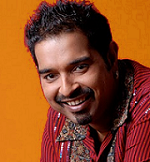 Start your musical journey with the Shankar Mahadevan! Just enroll in any of the courses below & get your first lesson with the Maestro himself! This course has been designed for students from the ages 6+ .. This is the first of the 4 courses designed to introduce you..
We will be starting with a program to learn basics of singin.. This course is aims to teach the student the basics of music.. This course is ideal for students looking to take their firs.. This course reinforces the concepts of Swar Sadhana and patt.. Welcome to the Shankar Mahadevan Academy, I'm truly excited this collaborative venture with Academy of Creative Arts. Our vision is to make learning of all styles of Indian music easy,accessible ,and fun. Whether you are a beginner or an experienced student, I can assure you that this journey of music learning and appreciation will be fun and very rewarding!